The voice of the first people is not only in print, media or communications that are discernible by mainstream measurements. The voice of the first people is the land. The voice of the first people is the water. The voice of the first people stretches centuries back to our creation stories. It is a voice that resounds with power and strength on this land. 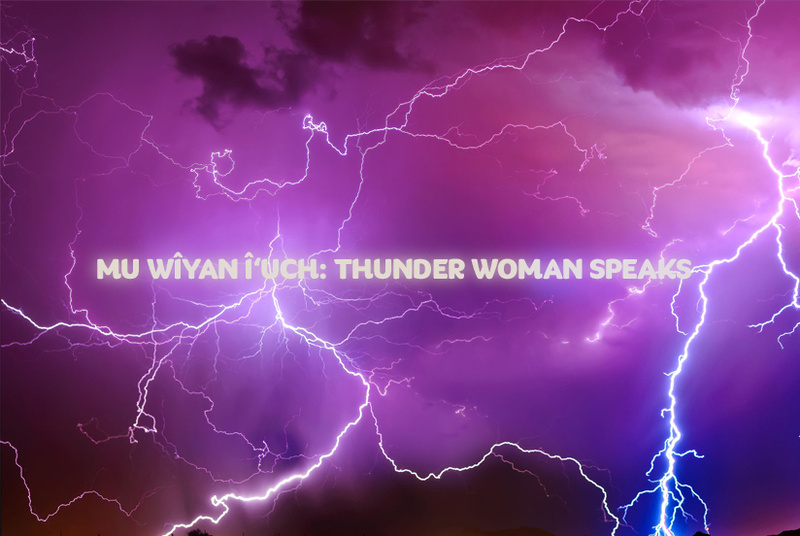 When Jody Wilson Raybould evoked the words of the true Indigenous laws of this land, these words resonated into the cosmos. Initial reactions from Mainstream media were the incredulity at what Wilson Raybould shared with the justice committee. Very quickly, global media sources were quoting this event. An Indigenous woman, originally from the west coastal people was delivering in the Canadian House of Commons a lesson on what the “rule of law” actually meant. She did not get this understanding from her undergrad or degree from mainstream institutions. Jody Wilson Raybould reminded the world and herself that the original laws and teachings of her own people are instilled within her own blood memory and DNA. Global media focused on the past corruption of a global corporate actor, the placement of deferred prosecution agreement, or remediation agreement in an omnibus bill, and the unwillingness of a Liberal cabinet to lose footing or seats in the province of Quebec. The corruption of a Liberal or Conservative government is not something new to the First Nations or people like Jody Wilson Raybould have had to encounter. In 2012, the Conservative sitting federal government under Prime Minister Stephen Harper put forth an omnibus bill where they attacked the protection of waters and also, hidden in this legislation was also an amendment to land surrenders or designations on reserve. But Harper’s Bill C-38 had one positive outcome. It united the indigenous people in Canada and launched the IdleNoMore movement. Similarly, with Jody Wilson Raybould, there is an “indigenous take” on her testimony. The most important factor was not the fact that the Liberals were guilty of some serious corporate cronyism. The most important factor was that after 152 years, a sitting member of the white Canadian parliament had not followed the rule of whiteman made law. Jody Wilson Raybould quoted her own experiential learning, the laws of the Big House and her position as a matriarch and truth-teller. This action by Jody Wilson Raybould was heard, not only by the Indigenous people throughout this land called Canada; the land, itself, heard her words. Our ancestors are in this land. The relationship between the Indigenous and the land is absolute. Repeated attempts to explain the spiritual significance and cosmic connection that the original people have in this territory falls deafly on mainstream ears. The Indigenous “anthropomorphize” tangible objects. Mainstream sees a tree and a specific land area in monetary terms. The Indigenous sees the same tree, but they see the places where our people took shade or sheltered. The Indigenous know the place name and the stories of this place and the power that still lives. The difference in our memories and the difference in our history, means the application of law will be different for the Indigenous and the non-native who are guests in this land. This is the conflict between Mainstream and the Indigenous. This is why there can be no reconciliation. For the Indigenous to reconcile, they have the option of assimilating into the larger society and becoming “equal” to the non-native so that they can finally take up their roles as “Canadians”. The indigenous must come to see the tree as just a tree with a price tag or a value attached. If the Indigenous cannot see this tree like a commodity, they have a second option. This option is to maintain their Indigenous teachings and understanding and to go forward until the larger society begins to reconcile their view with our understanding. Jody Wilson Raybould has opened this doorway. Only after the initial fray, mainstream media began to write that Jody’s words returned her to her teachings as a Kwakwaka’wakw person. Therefore the heart of democracy and the noble action Jody Wilson Raybould took in not acquiescing to party pressure came from who she is as a person. Integrity cannot be taught. Integrity must come from within and must be supported by the systems that exist around a person. In the Indigenous systems, there is respect for all life, because the Indigenous understand the Creator, the Great Mystery has made all things. There is no hierarchy of animals, rocks or water, there is only existence and co-existence. In this system, if you value or respect the land, the waters, the animals, the plants and all things, you have innate respect before any other measurable. Where is the integrity in the non-native system? With technology, humans separate themselves from each other and from the natural world. With this separation, there is no connection, no reminder and no awe for the wonders of this world. Within the mainstream system, there are false examples of integrity like returning a lost wallet. If there is money involved, and money is measured, then there is integrity in this action. When the newcomers to this land begin to operate in a system of interconnected understanding, they too will begin to understand what integrity means. It is standing at the edge of headwaters, looking at the mountains and seeing a line of shadowed ancestors, praying and resting in the foothills. It is in seeing a grizzly bear show its young how to push over trees in an area that has always been where the grizzlies go to dance. It is returning to the places where salmon swim against the current to reach their destination with determination and glory. It is in the comforting winds that gently rock babies to sleep in their swings. All these things do not cost and have no “apparent” monetary value. The value is in the eternal song of life that continues because of the respect, the integrity and the love each part shares for the other. It is in the Indigenous law of this land.